Imagine a concrete mix design that would fill an ICF perfectly—no voids, no honeycombing, perfect encapsulation of rebar—without using any type of vibration. 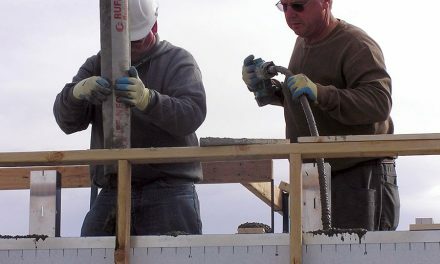 “Self-consolidating concrete, also known as self-compacting concrete and SCC, is a highly flowable, non-segregating concrete that spreads into place, fills formwork, and encapsulates even the most congested reinforcement, all without any mechanical vibration,” explains the website of the National Ready Mix Concrete Association (NRMCA). And SCC delivers this performance while matching the strength and durability of traditional mix designs. 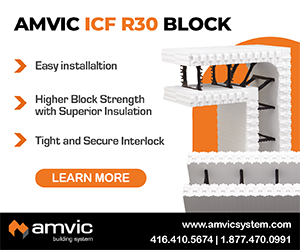 Clearly, SCC offers a number of advantages for ICFs. It can be placed faster, and needs no mechanical vibration. It can easily fill hard-to-reach areas (under window bucks, for instance) and around congested rebar. The low viscosity means it will pump more easily, and require moving the boom less often. 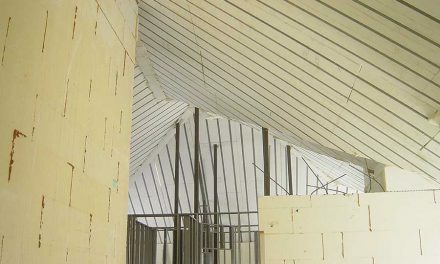 Simply put, SCC saves labor, increases quality and shortens construction time. Although its use is not widespread in North America, it is already common in Europe and other parts of the world. The technology to create SCC has been around since the 1980s. 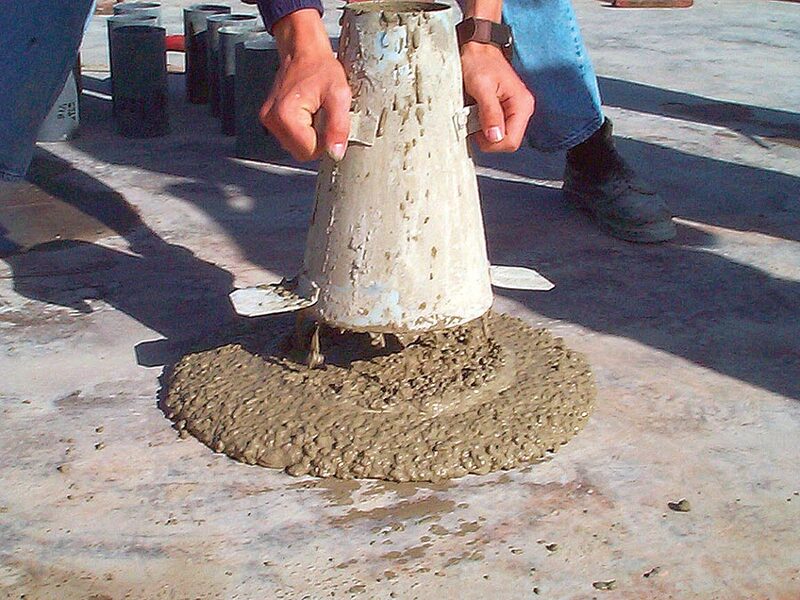 In the past, “soupy” high-slump concrete meant adding lots of extra water. But excess water allows aggregate to separate, greatly increases form pressures, and compromises strength and durability. SCC has none of these drawbacks. In fact, it contains the same percentage of water as a typical four to six-inch-slump mix. The “secret ingredient” is a super-plasticizer called Polycarboxylate (pronounced poly-carbo-ZYE-late). More precisely a “polycarboxylate-based high-range water-reducing (HRWR) admixture,” it makes the concrete flow freely. This HRWR works by “magnetizing” the aggregate and cement. Polycarboxylate molecules have an electrical charge, and when they coat the cement particles, the particles repel each other, increasing flowability and keeping the aggregate suspended. Aggregate suspension is also helped by increasing the percentage of sand and mineral fines. SCC is so fluid that typical testing methods fail. When the slump cone is lifted, this stuff flattens like a pancake. So instead of measuring the height of the pile, with SCC you measure the width, or the diameter of the pancake. This is actually the most common field test. The spread, or “slump flow” can range from 18 to 32 inches, with a 23-inch spread being most common. Even though SCC settles to virtually flat, it takes several seconds. The time it takes to flatten (T-Value) is an important characteristic. During the slump flow test, the T-Value can be estimated by measuring the time between the moment the slump cone is lifted and when the concrete reaches a spread diameter of 20 inches. T-Values can vary between 2 and 10 seconds. There are also a series of tests that evaluate how well the material flows through congested rebar. U-Box and L-Box tests use a box. The J-ring test puts a rebar cage around the slump cone. All of these are intended to measure how well the SCC spreads through the cage, and also if the cage causes aggregate segregation. An ACI committee has recently completed a set of guidelines to help select the appropriate slump flow for various conditions (type of construction, placement method, density of reinforcement, etc.). The batch plant will create the lowest slump flow required for the job. This keeps costs down and ensures stability. 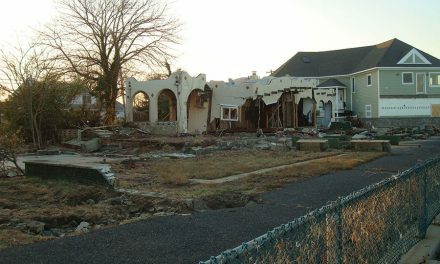 One of the biggest concerns ICF contractors have with SCC is the amount of form pressure it creates. Current guidebooks, like the American Concrete Institute’s (ACI) Manual of Concrete Practice (i.e. ACI 347R) do not specifically address SCC, but recommend that formwork should be designed to withstand the full hydrostatic head of fluid concrete. 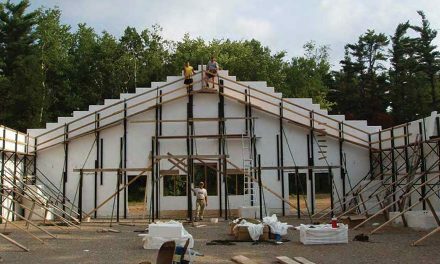 This would limit ICF use to walls only a few feet high. 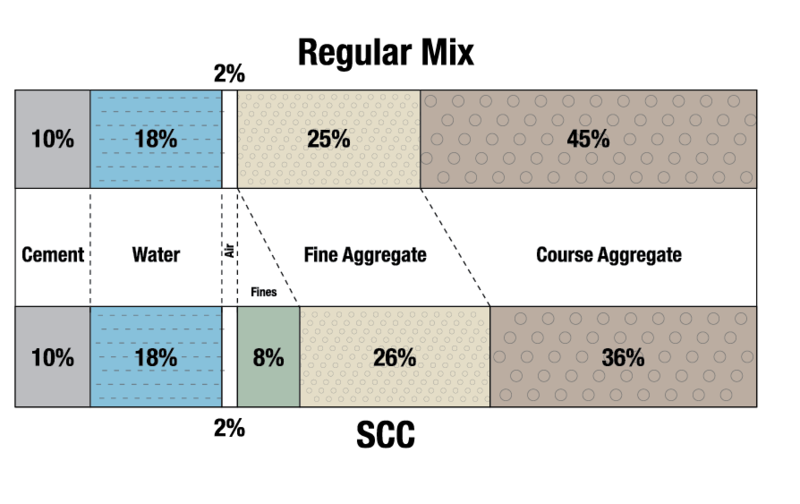 Contractors that have used SCC in the field, though, say that form pressures with SCC are similar to those with conventional mixes. Bury, at BASF, says they’re possibly even lower. In an effort to achieve a better understanding, the NRMCA commissioned two professors at the University of Illinois to research the topic. They reported that both laboratory experiments and field tests have shown that SCC does not generate anywhere near full hydrostatic pressure. For instance, in 2002, two other researches filled a 28-foot-tall wall in 20 minutes, and the actual maximum pressure was only 64% of what the full head pressure should have been. 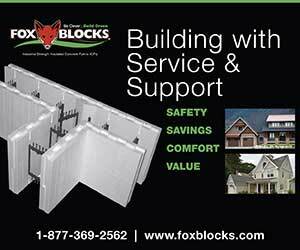 A similar study at the University of Illinois at Urbana-Champaign filled a 28-foot wall at a rate of 5 ½ feet per hour. The maximum pressure was only approximately 20% of the maximum hydrostatic pressure, about 5.5 psi. Interestingly, in both these tests the greatest pressure was not at the bottom of the wall, but about three feet up. The reasons for the diminished pressure is not completely understood, but it’s believed to be partly caused by aggregate bridging. “It is thought that as the material fills its form the aggregate will line up and touch each other to form a skeleton in the fresh concrete. As the gelation and hydration processes occur, this bridging will get stronger and will lead to a drop in formwork pressure,” the study reports. Additional information on SCC is readily available from all of the major concrete organizations, including the Portland Cement Association (PCA) and NRMCA, as well as major admixture manufacturers, such as BASF and Fritz-Pak. 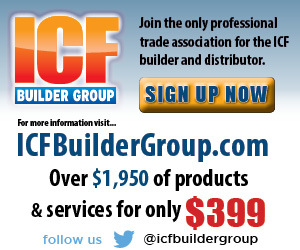 It appears that ICF contractors could benefit from SCC. Since it flows easily and self levels with minimal consolidation, placement is quick and easy. Vibration is eliminated, saving on labor and equipment wear and tear. Engineers and designers also benefit, as the lack of voids and perfect consolidation around reinforcement means more reliable design assumptions. As to the cost, Bury says it varies widely, depending on “whether you want the Chevrolet or the Porsche.” He says in most parts of the country, SCC runs about $8 to $50 more per cubic yard than regular mixes.